Paint odor can be extremely unpleasant and may concern you because of your exposure to harmful emissions. It is true that painting your house will give it a welcome fresh new look, but at the same time you might end up with new paint odors and new hazards as well. When faced with this problem, many homeowners look for ways to get the paint odor out in the easiest, quickest, and most convenient way to safeguard their family. The main cause of the paint odor can be attributed to the volatile organic compounds (VOCs) it contains. As the paint dries, the VOCs are released and result in toxic fumes causing the smelly paint odors. Sinusitis and asthma are potential side effects from inhaling paint odor. It also may result in throat irritation, burning eyes, sneezing, and other issues. The best thing to do is to prevent the paint odor in the first place. This can be done by using low VOC or zero VOC water based paints. This will significantly lower the emissions and hence the paint odor. However, if you have used solvent based paint or other paint that has resulted in paint odor, it’s time to take immediate action to get the paint odor out. Fortunately, there are a number of good solutions to rid paint odor from paint and prevent exposure to harmful chemicals. The first step to get the odor out from paint is to introduce as much fresh air into your home as possible. Open all the windows and doors and leave them open as long as it’s possible. Install window fans to draw the paint odor out of your home. This will help dilute the paint odor and reduce the hazards form the VOCs. The second step is take immediate action to get the paint odor out of your home using the best solution. At first glance, you might be tempted into using some of the home remedies suggested on the internet to rid paint odor to save money. The commonly proposed cures include using vinegar, coffee, charcoal, baking soda, and even newspapers! So, what’s a person to do? I would suggest using your household items for what they were designed to do best. After all, if they were such great paint odor removers, wouldn’t the manufacturers have already marketed them as paint deodorizers for more money? It’s important to remember that as time passes you may get used to the paint odor. You might start thinking that the home remedies are helping but the paint odor could still be floating around in your home and affect the health and wellbeing of your family without your knowledge. Why turn your home into a scary science project and start experimenting with questionable home remedies when you can use scientifically engineered and tested paint odor removers that are guaranteed to work effectively. The good news is I’ve discovered a professional strength targeted odor remover made specially to get the odor out from paint but costs even less than most home remedies. I recommend using SMELLEZE® Reusable Paint Odor Remover Pouches to rid paint odor without covering-up with harmful fragrances. Simply place the pouch in areas with paint odor or place them inside your return air vents and smell the difference. 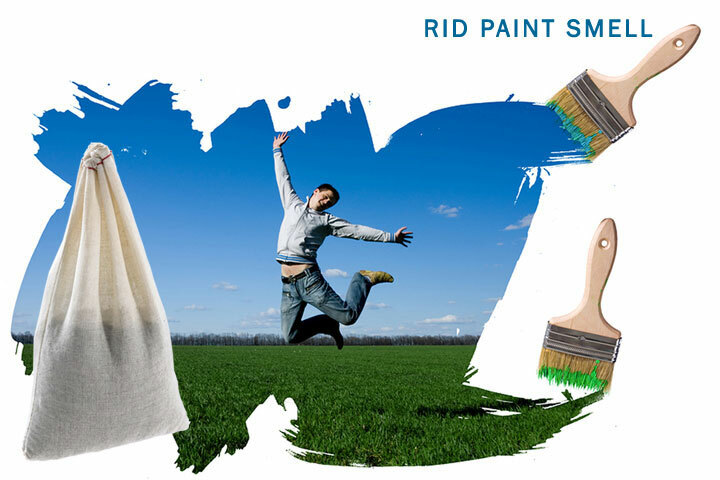 This amazing paint smell removal product will help rid odor because it works continuously to filter the air 24/7. The remarkable SMELLEZE™Paint Deodorizer sells for only $12.99, and since it’s reusable for over a year, the average cost is only about 3 cents/day! If safety is important to you, you will be happy to hear that this paint odor removal product is totally safe, non-toxic, natural, odorless, and doesn’t contain any harmful chemicals. If you are environmentally conscious, you will be glad to learn that SMELLEZE™is an eco-friendly, reusable, and recyclable paint odor remover that doesn’t use any energy. Furthermore, this is an innovative 100% American paint odor removal product that is designed, engineered, and manufactured in the USA. If all this sounds too good to be true, just look at the many unsolicited raving customer reviews for this paint odor remover that has a 20+ year proven track record. Kim Kennedy is a freelance odor remover blogger who writes about eco-friendly paint odor removal products that rid odor from paint without covering them up with fragrances.